THis "can be said" as a new ELF malware. A DDoSer, encrypted (w/Xor) in comm. It looks like originated from China. For the code used, as per sources, looks new design. But for the general works, it adapts IptabLes and AES.DDoS. But this variant has specific XOR used. So in the mean time I called it Linux/Xor.DDoS, some people will make their own name anyway. Feel free to improve thread with analysis, new findings or opinion, thats related to the ELF malware used, PS: not the hack scheme used please. Our MMD mates were dissecting the codes while I did the binary and checking overall scheme. Threat is up and alive, many things has to be shutdown in this scheme. Yes. we noted that, it is on authority investigation, we backed off the case as per instructed. Kindly not to access if not want to be logged. The CNC IP is hardcoded in the near of this symbol. All these binaries are dropped via the shellscript 'drop' in my attachment. shell. Must be some automated botnet behind that. The deobfuscated drop file is: 'drop.decrypted'. 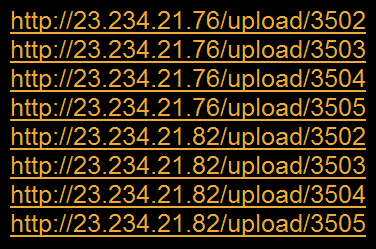 Check my attachment for whois information/ nmap scans about this threat. 080CBD84 00 00 29 10 00 00 00 00 00 00 00 00 B0 FA 0A 08 ..).........ｰ・.